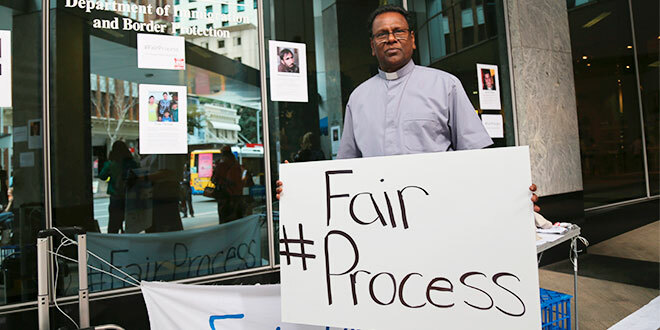 IN the lead-up to Refugee Week, Christians have held daily vigils outside the Brisbane offices of the Department of Immigration calling for a fair onshore assessment process for asylum seekers. Thousands of asylum seekers living in Australia have been given until October 1 to submit their asylum claims, or risk deportation. Many of the asylum seekers have waited months, and in some cases years, but have not yet made applications. Brisbane’s only two free refugee legal-aid clinics are now inundated with a rush for help to complete applications. “Right now in our communities, thousands of vulnerable people seeking asylum are at risk of being deported back to danger if their applications for protection are left incomplete, as a result of being rushed through because of the October deadline,” vigil organiser Peter Branjerdporn, from Christian protest group Love Makes a Way, said. “The Federal Government has cut legal funding and translation assistance for most people who came by sea, so they are left unassisted with filling in a 60-plus-page application form with over 100 questions, increasing their risk of omitting vital information and therefore putting their claims to asylum at risk. Fr Jordan said he joined the vigil to pray for politicians and remind them of their responsibility to ensure justice for refugees. “The power of prayer should not be underestimated and can change the mind of Minister for Immigration Peter Dutton,” he said. Refugee Week runs from June 18-24.